PRINCETON PROCESSION: The Class of 2012s pre-rade is on its way to officially enter the university through its main gate, following the Opening Exercises at the University Chapel. 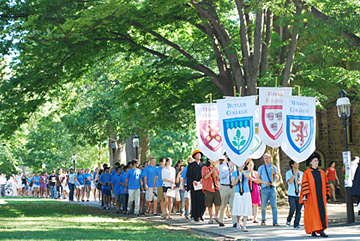 Listen, learn, deliberate, and then, in an act of engaged and responsible citizenship that embodies the spirit of ancient Athens and revolutionary America, vote, urged Princeton University President Shirley Tilghman in her address to the Class of 2012 during last Sundays Opening Exercises. Revenues associated with trucks and cars provided two of the main discussion points at Monday evenings Township Committee meeting. The genuine affection area residents feel for the Community Park Pool, and their consequent reluctance to see changes made in the complex, were clearly in evidence at last Saturdays Princeton Recreation Departments special free-swim/pool-renovations discussion. At its meeting last Thursday, the Princeton Public Library Board of Trustees approved a budget for 2008 totaling $4,922,237. Library Director Leslie Burger described the budget as exactly what we asked for, and thanked the Borough and the Township for their respective contributions. Last years total budget was $4,550,390. Borough Council member David Goldfarb elaborated upon the goals of the FreeB jitney shuttle service at the Council meeting last Tuesday. The first is to get people out of their cars, and the second is to identify a long-standing unmet transportation need and get people where they want to go, he said. Sarah Peteraf and her teammates on the Princeton University womens soccer team were thrilled last Friday as they played the first-ever game at the schools new soccer complex, Myslik Field at Roberts Stadium. For the Princeton High football team, reaching the state playoffs last fall turned into a matter of being careful what you ask for. In rolling through last fall, the Princeton High boys soccer team hit just one roadblock.